Ann Arbor Area Transportation Authority special board meeting (July 23, 2013): No regular board meeting was scheduled for July, but the AAATA board called a special meeting toward the end of the month, to handle some unfinished business. That included: (1) authorization of a contract extension with Select Ride to provide required paratransit service under the Americans with Disabilities Act (ADA); and (2) authorization of a contract to move a fire hydrant at the AAATA’s headquarters at 2700 S. Industrial Highway. The possibility of the special meeting was indicated at the AAATA’s June 20, 2013 board meeting, when CEO Michael Ford mentioned that a special session might be called to handle some routine matters – as well as issues related to the addition of the city of Ypsilanti as a member of the AAATA. The two cities currently levy millages that are dedicated to transit, which are then passed through to the AAATA. The ability for the renamed AAATA to levy such a millage with voter approval was a power also enjoyed by the AATA, but was never exercised. The request for additional funding – through a levy by the AAATA – is based on an AAATA plan to increase and expand service in the two cities and through establishing longer-term purchase-of-service agreements with some adjoining townships. The authorization of a $109,000 contract with Blaze Contracting to relocate the fire hydrant was the second time the board has authorized such a contract. Last year, the board approved a deal with RBV Contracting for the work. However, the contract was not awarded, because the necessary agreements with the University of Michigan, which owns adjoining land involved in the hydrant relocation, were not in place. The board’s action to approve the Select Ride contract – which is valued at $3,016,871 for the coming year – came under time pressure to ensure that the AAATA could continue its paratransit service. The provision of complementary paratransit service for people with disabilities – as an alternative to the fixed-route service – is a requirement of the Federal Transit Administration under the Americans with Disabilities Act. Under the negotiated terms, the third year of Select Ride’s contract includes a one-time “stabilization payment” to Select Ride of $100,000 to be paid by July 31, 2013. The contract also includes a 5% ($150,000) increase for this final year of the contract. The staff memo in the board’s information packet attributed the increases to the rising consumer price index (CPI) and to fuel costs. The state’s local bus operating (LBO) assistance – money from Act 51 that’s allocated to transportation agencies statewide using a complex formula – was a topic that arose during the July 23 special meeting in two ways. As a result of state legislative action, the AAATA now expects $800,000 of previous decreased funding from the state’s LBO to be restored. When the Michigan Dept. of Transportation applied the distribution formula last year, it resulted in about $800,000 less funding to the AAATA – and that had an impact on the AAATA’s FY 2013 budget. The agency is currently operating on slightly less than the 3-month cash reserve required under board policy. At the July 23 meeting, it was reported that a bank transfer of $500,000 had taken place, with the remaining amount expected later. The LBO is also a source of funding that the southeast Michigan regional transit authority (RTA) would like to use to cover administrative expenses. The RTA was created in late 2012 through a lame-duck legislative action. The RTA is supposed to coordinate transit in a four-county region (Washtenaw, Wayne, Macomb and Oakland) that includes the city of Detroit. AAATA board members expressed some disappointment during their July 23 meeting that Gov. Rick Snyder and the state legislature had created the RTA without providing for adequate initial funding. The RTA could eventual obtain voter-approved funding through a millage or a vehicle registration fee. AAATA board members objected to the fact that LBO money was being used for the administrative overhead of the newly created RTA, instead of being used to provide transportation “on the street” by the transit agencies in the four-county region. Those include DDOT (Detroit Dept. of Transportation) and the Suburban Mobility Authority for Regional Transportation (SMART). The negative impact on the AAATA for the next year of funding for the RTA – using the state’s LBO assistance – is estimated at about $68,000. The board was asked to approve a third and final year of a contract with Select Ride – to provide complementary paratransit service for the Ann Arbor Area Transportation Authority. The contract is valued at $3,016,871. Select Ride is a private taxicab company. The negotiations for terms of an extension to a third year of Select Ride’s contract included a one-time “stabilization payment” to Select Ride of $100,000 to be paid by July 31, 2013. The contract also includes a 5% ($150,000) increase for this final year of the contract. The staff memo in the board’s information packet attributed the increases to the rising consumer price index (CPI) and to fuel costs. The AAATA fulfills its obligation under the ADA through its A-Ride program. In addition to trips that can be arranged at least one day in advance for a $3 fare [which is twice the $1.50 full fare for regular fixed-route rides], same-day trips can be arranged through A-Ride for a $4 fare. The higher fare can be charged for those trips, because they are not being offered under the ADA requirement. Some holders of A-Ride passes – who have the right to reserve rides for $3 under the A-Ride program – might also be physically able to ride the AAATA regular fixed-route system. If they opt to ride the fixed-route system, the A-Ride program allows them to do that without paying a fare. According to AAATA controller Phil Webb, the total value of the Select Ride contract was estimated based on 37,728 passenger trips on lift-equipped vans (accessible service) and 79,716 passenger trips in taxicabs, along with a monthly fixed fee. Fares are collected by Select Ride, and Select Ride subtracts that amount from the total revenue it is provided under the contract. Passenger fares are projected to be about $405,000 – so the total amount paid to Select Ride by the AAATA will be about $2,612,000. That yields a total value of the contract of about $3,017,000. Carolyn Grawi of the Ann Arbor Center for Independent Living addressed the board at the start of the meeting during the time allotted for public commentary. She addressed the agenda item on paratransit services. First, she wanted to see the AAATA support the current service as it is, saying that it’s important to make sure that the service is not interrupted in any way. If there are hiccups in the system, then it’s important to make sure that those hiccups are smoothed out, she said. And second, Grawi continued, as the AAATA thinks about how to expand service beyond the city of Ann Arbor – in the context of the “urban core” discussions – she did not think that expansion should be undertaken at the risk of losing or altering how paratransit services are currently provided. So as the AAATA considers expanding service into areas that currently do not have any service, she cautioned, this would be an important point of conversation – namely, how to meet the needs of paratransit riders. During public commentary time at the end of the meeting, Grawi expressed concern about the extension of the paratransit service throughout the entire area of the southeast Michigan regional transit authority (RTA). She pointed out that the location of the RTA board meetings are not accessible to members of the community who would like to attend them – not just for people with disabilities, but for anybody who doesn’t have access to a vehicle. Also during public comment time at the end of the meeting, after the vote on the Select Ride contract was taken, Thomas Partridge called into question the urgency of extending the Select Ride contract. It’s one of the most important topics on the annual agenda of the AAATA board, he said. It should not have been approved without better notice to the public, he contended, or without a public hearing on the issue. He accused Select Ride of taking advantage of vulnerable users of the transit system. He complained about a lack of an adequate number of vehicles to provide the paratransit service citywide. He referred to suspicious manipulation of schedules for pickup times and routing. As Partridge’s two-minute time period expired, Charles Griffith – who was presiding over the meeting as chair of the board – thanked Partridge for his remarks. Partridge asked for an extension of one minute. Griffith asked Partridge to try to wrap up in less than a minute. Partridge continued by telling the board that the AAATA needed to take a more universal, integrated approach to protecting the most vulnerable users of the buses and the A-Ride program. Partridge called for more flexibility. He said that no A-Ride cardholder should go without a ride, even if that user made a mistake in reserving a ride or has a health need that required a shorter pickup time. He accused the reservation takers for the program of being rude. Griffith told Partridge that he felt the board had gotten his point, and Partridge concluded his remarks with a thank-you. 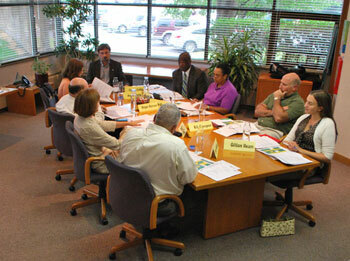 The AAATA board’s special meeting was held at the headquarters building at 2700 S. Industrial Highway. Clockwise starting at the head of the table: Charles Griffith, Michael Ford, Susan Baskett, Eli Cooper, Gillian Ream, Eric Mahler, Sue Gott, Roger Kerson, and Anya Dale. A bit later during the meeting, during Ford’s remarks about the draft work plan for the coming year, Ford noted that the third and final year of the Select Ride contract included some additional performance indicators and metrics that he called “long overdue.” As the AAATA looked at delivering paratransit services for the elderly and the disability community in the future, Ford felt there were some opportunities to establish better accountability and control. As an example, Ford gave the possibility of scheduling rides in-house by the AAATA. A request for proposals (RFP) for the paratransit service for the following year would be issued soon, which would reflect some changes and some major improvements in how paratransit service would be delivered in the future, Ford concluded. When the board reached the Select Ride contract on the agenda, Ford introduced the item, noting that there were two different parts – the stabilization payment of $100,000 and a negotiated contract increase for 2014 of 5%. He pointed out that the rationale for the increase was included in the memo that had been provided to the board. It was a rationale based on increases in the consumer price index (CPI) and the gasoline index. The contract also included increased performance standards, Ford noted. Ford reiterated how a new request for proposals (RFP) would be issued in the first quarter of the year, saying that the AAATA would be looking at different ways to operate the complementary paratransit service – to give itself more flexibility than it has had in the past. Ford asked the board for its support to move the final year of Select Ride’s contract forward. He recognized that the process had involved some hiccups, reiterating the fact that the contract should have been reviewed by a board committee first – before coming before the whole board. “There are some areas that we just need to bone up on internally,” Ford said. But Ford stressed it was important that the paratransit service was not interrupted and that the AAATA was able to provide that necessary service. As a result of this situation, Ford continued, it was recognized that the AAATA needs to have contingency plans in place [in the event that a contractor is unable or unwilling to continue a contract]. He asked the board again for its support for this particular contract and indicated that the staff would work diligently on these types of issues going forward. Roger Kerson asked for clarification about the three years of the contract: Was the AAATA obligated to renew the third year of the contract? He asked why the contract needed to be changed at all. Ford clarified that it was the third year of the contract – the second extension of a one-year contract that had a provision for two extensions. Kerson noted that the inflationary increase was 2.3%, but he calculated that overall Select Ride was getting an 8% increase in the contract. So Select Ride was getting more of an increase than the increasing costs would justify, Kerson indicated. He asked if Select Ride had contended that they could not continue to provide the service unless there was an increase. Ford indicated that this was part of the issue. Continuity of service was important, Ford said. It’s not an ideal situation to be in, he allowed. Ford indicated that he felt action should have been taken earlier to address the situation within a 120-day window. Ford explained that staff had considered the option of bringing the complementary paratransit service in-house. Accomplishing that within a two-week time frame, he said, was going to be a problem. Extending the contract under the terms proposed was something that Ford characterized as the “next-best solution.” The AAATA would be able to keep the continuity of the service intact, he said, and would also learn from the experience – so that in the future there would be more flexibility and more control. Kerson wondered how the AAATA could even provide the service in-house. Ford indicated that some of the service is provided with vans, and some of the service is provided with cabs. Ford felt that the AAATA could, in any case, provide the scheduling of the service. Scheduling of the service is where potential efficiencies of the operation reside, Ford explained. Webb indicated that if the state of Michigan restores the remaining 25% of previously lost LBO funding, as the AAATA expects – in addition to the $500,000 in restored funding that the AAATA had already received – then the three-month operating cash reserve could be maintained, while accommodating the Select Ride contract. With that assurance from Webb, Cooper indicated his willingness to go forward supporting the Select Ride contract. Cooper called agreeing to the contract very difficult, but encouraged his board colleagues not to lose sight of the fact that at the end of all of the conversation are people – who desperately need transportation services. Board chair Charles Griffith also indicated support for approving the contract. He trusted that the staff had done their best to negotiate the best deal possible with Select Ride. Outcome: The board voted unanimously to authorize the contract with Select Ride. The board was asked to authorize a $109,000 contract with Blaze Contracting to relocate a fire hydrant. In the same resolution, a previous authorization to award a contract with RBV Contracting was rescinded. That earlier authorization had been approved by the board at a meeting a year ago, on July 16, 2012. The board’s July 23, 2013 resolution included an amount of $35,000 to cover city of Ann Arbor permits, physical testing and additional oversight – to be provided by Spence Brothers (AAATA’s construction manager). The city of Ann Arbor is requiring that the hydrant be moved – as part of the AAATA’s bus garage expansion project. In its new location, the hydrant will connect to the adjacent property, owned by the University of Michigan, creating a continuous loop for the fire hydrant system. Minutes of the AAATA’s planning and development committee, which reviewed the fire hydrant contract, indicate that board member Sue Gott abstained from the vote because the issue involved negotiations with the University of Michigan, which is her employer. At the July 23 meeting of the full board, CEO Michael Ford summarized the background of the proposal. Gott abstained from the vote, because it involved a transaction between the city and the University of Michigan. Gott is the university’s chief planner. With no further discussion, the matter moved to a vote. 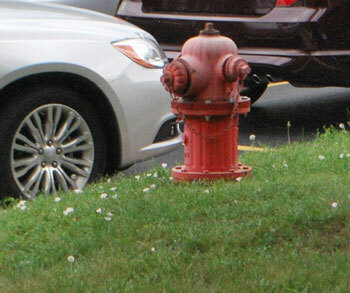 Outcome: The board voted to approve the contract to relocate the fire hydrant. Sue Gott abstained. In non-voting items of communication, the increase and expansion of transportation service inside and outside the city of Ann Arbor boundaries was highlighted in conversation about: (1) the “urban core” initiative, which includes the addition of the city of Ypsilanti as a member of the newly renamed Ann Arbor Area Transportation Authority; and (2) the initial funding mechanisms for administrative overhead of a four-county southeast Michigan regional transit authority (RTA), created in late 2012 as part of lame-duck action taken by the state legislature. By way of general background, on June 20, 2013 the board of the Ann Arbor Transportation Authority voted to revise its articles of incorporation to add the city of Ypsilanti as a member, and to expand the board from seven to nine members – one of which is appointed by the city of Ypsilanti. The geographic footprint of the Ann Arbor Area Transportation Authority is shown in green: the two cities of Ypsilanti and Ann Arbor. The city of Saline and the townships of Pittsfield and Ypsilanti have also been part of recent active discussions about committing to a more stable funding mechanism for existing service and expanded service. Board chair Charles Griffith opened the July 23, 2013 special meeting by welcoming Gillian Ream to the board table. Ream, who is communications and development director at the Ypsilanti District Library, was appointed as the city of Ypsilanti’s representative to the AAATA. But the paperwork has not all been filed to make her an official board member. Griffith put it this way: “And I’d like to welcome our newest almost board member. We are signing the papers right now – and apparently they have to be filed before you are an official, sitting, voting board member. We’re happy to have you here today and welcome you to the board, and soon in a voting capacity.” Griffith said that he hoped the board up to now already had been representing the interests of the city of Ypsilanti, noting that Ypsilanti had historically been a great partner with the AAATA. Michael Ford, the AAATA’s CEO, also welcomed Ream to the board during his remarks near the start of the meeting. He described the city of Ypsilanti as having always been a good partner with the AATA. Regarding information and orientation, Ford stressed that the organization is there to support Ream in any way possible. While the change to the articles of incorporation has affected the governance of the AAATA, the goal of the governance change is to provide a way to generate additional funding for transportation. The AAATA could, with voter approval, levy a uniform property tax on the entire geographic area of its membership – a power also enjoyed but never exercised by the AATA. The cities of Ann Arbor and Ypsilanti now levy their own dedicated transit millages, which are transmitted to the AAATA. However, Ypsilanti is currently at its 20-mill state constitutional limit. A millage levied by the AAATA would not count against that 20-mill cap. Current discussions are based on the idea of increasing levels of service – both frequency and the hours of operation – within the Ann Arbor and Ypsilanti city boundaries as well as in the adjoining townships of Pittsfield and Ypsilanti and the city of Saline. The additional amount of local funding for the planned increases in service would be the equivalent of around 0.6-0.7 mills. One mill is $1 for every $1,000 of a property’s taxable value. An AAATA millage proposal would require voter approval. Going into the special meeting called for July 23, there was an outside chance the board could have voted to place a question on the November 2013 ballot. The deadline for making such a decision is late August. [Ballot language must be certified to the county clerk by Aug. 27, 2013.] The practicalities of mounting a successful millage campaign pointed toward not asking voters for a millage this fall, however. During public commentary at the end of the meeting, Vivienne Armentrout addressed the board on the topic of the initiative to increase transportation services. She thanked the board for voting to make the city of Ypsilanti a member of the AAATA. But she characterized it as happening “a little fast.” Still, she reported that everyone she’d talked to had said that the move made a lot of sense. One of the questions that taxpayers like her, who pay the transit millage, would be asking as the AAATA seeks to expand services is: How will the purchase of service agreements (POSAs) with the townships be calculated and what expenses are folded into the charge? She did not think that most people would say it’s fair for Ann Arbor to subsidize wealthier communities with a discount rate. So she hoped those calculations would be fully fleshed out in any proposal. Jim Mogensen addressed the topic of the expanded local geographic footprint as well as the four-county regional transit authority – from the perspective of Title VI compliance. He briefly described Title VI as part of the federal Civil Rights Act of 1964. The act requires that federal funding comes with some constraints, which prohibits differential impacts to transit service with respect to race. Mogensen said he was pleased to see that Title VI was now in the work plan for the AAATA. But he cautioned that the timeline should be accelerated. Mogensen said he believed that the hourly headways on the Ypsilanti local routes are a problem with regard to the possibility of disparate impacts. He felt that the AAATA would need to look at that issue for the purpose of entering into long-term purchase of service agreements (POSAs) and also for having a plan going forward with the RTA. He felt that all of the solutions to the Title VI issues should be in place before the RTA moves forward. “This is the time to think through that kind of stuff,” he said. Even if the formula is baked into the POSAs, he said, the AAATA is still responsible for compliance. It could cause a lot of trouble, he cautioned. With respect to the RTA, Mogensen cautioned that the AAATA could find itself as the “Ypsilanti of the RTA.” Ann Arbor, for reasons that makes sense, he said, has driven the policy of the AAATA. The tables may now be turned, and other actors in the transit world may move policy at the level of the RTA. That needs to be kept in mind, Mogensen concluded. During his report to the board, CEO Michael Ford described a proposed master agreement between the regional transit authority and the AAATA as arising out of a memorandum of understanding (MOU). The RTA had also asked the AAATA to identify its top five priorities for projects to work on from a regional perspective, Ford said. Improved and expanded transit options within Washtenaw County, particularly in the “Urban Core” of Ann Arbor and Ypsilanti. Transit options from Livingston County into Ann Arbor area. The draft includes three cross-regional priorities for the AAATA. ExpressRide between Canton and Ann Arbor (within 1 year). Funding/development for transit technology improvements (e.g. Transit Signal Priority). Ford asked that the board provide any additional feedback on the RTA document. Local bus operating funding factored prominently in the board’s discussion of the RTA. By way of additional background, the state’s local bus operating (LBO) assistance is money from Act 51 that’s allocated to transportation agencies statewide using a complex formula. When the Michigan Dept. of Transportation applied the distribution formula last year, it resulted in about $800,000 less funding to the AAATA – and that had an impact on the AAATA’s FY 2013 budget. The agency is currently operating on slightly less than the 3-month cash reserve required under board policy. As a result of subsequent state legislative action, the AAATA now expects $800,000 of lost funding from the state’s LBO to be restored. At the July 23 meeting, it was reported that a bank transfer of $500,000 had taken place, with the remaining amount expected later. The comprehensive transportation fund, from which the LBO is taken, is also the source of funding that’s initially being used by the southeast Michigan regional transit authority (RTA), which was created in late 2012 through a lame-duck legislative action. The RTA is supposed to coordinate transit in a four-county region (Washtenaw, Wayne, Macomb and Oakland) that includes the city of Detroit. AAATA board members expressed some disappointment during their July 23 meeting that Gov. Rick Snyder and the state legislature had created the RTA without providing for adequate initial funding. The RTA could eventual obtain voter-approved funding through a millage or a vehicle registration fee. Roger Kerson brought up the issue of the RTA’s funding mechanism – the state’s local bus operating assistance (LBO). He confirmed with Ford that the RTA’s intent was to use LBO money that would equate to a negative impact on the AAATA of about $68,000 a year. Ford indicated that the initial amount that the RTA had considered was 2% of the total state LBO assistance and had decided to reduce it to 1%. That translated into an AAATA share of about $68,000. Sarah Pressprich-Gryniewicz, who’s AAATA community relations coordinator for the office of the CEO, reported that during the RTA’s transit providers advisory committee meeting, which had been held earlier that day, it was discussed that the RTA board was trying to reduce that amount even further so that no more than $68,000 would be required – with a contingency of around 10%. Kerson asked if that amount was something that Ford felt could be accommodated within the AAATA’s budget. Ford indicated that it could be. Kerson got clarification that the kind of contingency that was being discussed meant that the RTA could not ask for $68,000 and then come back and ask for $168,000. The RTA might be able to come back and asked for $70,000. Kerson pointed out that SMART and DDOT would also have to “kick in” their share as well. About the idea of the RTA using LBO money, Eli Cooper indicated agreement with earlier statements that “this is and feels wrong.” It’s a newly created transit agency to serve the region, he said, and the legislature and administration that created it should have provided adequate means of funding from state resources. As one of the transit authorities within the RTA region, AAATA should give notice to state legislative representatives that this approach is just taking away the ability to deliver services that the AAATA has struggled to provide and maintain, Cooper said. Those who created the RTA should find the resources in order to enable the AAATA to be even more efficient and more effective in providing mobility that will be “the grease for our economic machine within this entire region,” he said. Charles Griffith reported that he’d had a conversation with one of Washtenaw County’s RTA board members and with others about the alternatives for resolving the funding issue. He said he was aware of some “plans afoot to find another source of funds.” He called it a bit complicated in terms of other legislation that would need to pass in Lansing, but he thought it was quite possible that it could happen this summer. Griffith said he worried about the issue for the sake of the AAATA, but he also noted that the transportation agencies in the Detroit area are hurting even more. To take away from their operating budgets is not the preferred option, Griffith said. He ventured that it might be appropriate for the AAATA board to pass some kind of a resolution to encourage its RTA board members to “hold out on this.” Griffith felt that other legislative remedies should be tried first before the Washtenaw County RTA board representatives should agree to take money out of the AAATA’s operating budget. Mary Stasiak, community relations director for the AAATA, reported that the RTA board had not actually identified any other source of funding yet. Bill De Groot, the AAATA’s financial analyst and planner, provided background for the RTA’s current funding, which is an appropriation of $500,000 – $250,000 of which was in the original legislation that had created the RTA. The Michigan Dept. of Transportation had matched that $250,000. That amount of funding was expected to be exhausted sometime in December 2013 or February 2014, depending on how quickly the RTA hires staff and relocates its offices from the SEMCOG location, De Groot said. Kerson noted that the RTA is allowed to take this money under the enabling legislation but that the AAATA can tell the RTA that it’s a bad idea. De Groot told Kerson that it’s not called out specifically in the legislation – but because the RTA is in fact a transit agency, that source of funding is available to the RTA as a transit agency. 124.558 Appropriation. Sec. 18. There is appropriated to each authority created under this act the sum of $250,000.00 from the comprehensive transportation fund created in section 10b of 1951 PA 51, MCL 247.660b, to begin implementing the requirements of this act. Any portion of this amount under this section that is not expended in the 2012-2013 state fiscal year shall not lapse to the general fund but shall be carried forward in a work project account that is in compliance with section 451a of the management and budget act, 1984 PA 431, MCL 18.1451a. Griffith indicated that Washtenaw County’s RTA board members have a duty both to the Washtenaw County community and to the new entity. He’d heard a slightly different story from the one that De Groot had reported about how long the existing funding might last. Griffith said he was under the impression it would last the RTA through a good part of next year. So he felt there was perhaps a little more breathing room – in terms of identifying alternative sources of funding. De Groot said the only staff position that the RTA had identified to hire was a CEO. The application process would be closed and the interview phase would begin on Aug. 7, De Groot reported. But in the current budget model – which is only an expense budget, because the RTA has limited revenues – depletion of the RTA’s current funding would be somewhat quicker than what Griffith described. That expense budget would include office space rental, and salaries for about six employees total. There are a lot of things that the RTA has to do which are identified in its expense budget, but the only source of revenue at this time is the initial $500,000, De Groot said. [$250,000, plus another $250,000 from MDOT.] The expense budget of the RTA, De Groot noted, did not include any kind of expenditure for a millage campaign or for a vehicle registration proposal, or for the work of combining the master plans for the region. De Groot indicated that the Federal Transit Administration might have some money available for the planning work – but that’s still uncertain. Gillian Ream weighed in by saying it would be fantastic if alternative funding sources could be found. But she pointed out that there are overlaps between the priorities that the AAATA has identified for the RTA to work on, and its own work plan. So if there are things like doing research on traffic signal priorities, then the AAATA and the RTA should coordinate – especially if there’s funding that the RTA is receiving to do that kind of work. Kerson addressed the idea that Griffith had raised about passing a resolution to express a position on the RTA’s administrative funding, saying he felt it should be framed as: “We think bus operating funds should be used to operate buses – whether in our community or other communities.” Kerson said he did not want to see the issue framed as: “Don’t take AAATA money” – adding that the AAATA should support other transit agencies in its resolution. During the public commentary at the end of the meeting, Caroline Grawi of the Center for Independent Living addressed the board about the RTA. She agreed with Cooper about the funding issue, adding that she had spoken to both of Washtenaw County’s RTA board representatives [Richard Murphy and Liz Gerber] about that issue. She felt that because Gov. Rick Snyder lives in the Ann Arbor area, it should be possible to press the issue a little harder by saying: Hey, you wanted this to happen and now it’s happened, and now you need to make sure it’s funded. Present: Charles Griffith, Eric Mahler, Susan Baskett, Eli Cooper, Sue Gott, Roger Kerson, Anya Dale. Also present: Gillian Ream. Thanks for the information on the calculations of benefit from the April meeting, but they don’t quite address the point I was trying to make. I assume that POSA contracts are calculated on the basis of some sort of cost formula, how much it actually costs the AAATA to provide that particular service or route. That is how Ypsilanti fell short of being able to pay its POSA costs in the first place, because the costs shifted upward. My point is that if we are going to write a lot of extended POSA contracts, I’d like to see that cost formula include some system expenses, not just the cost of a driver and a bus. Otherwise the millage payers will continue to spend more and more on support of the system while the POSA customers will be paying a unit cost that is much less. I’d like to see an overhead fraction included in the POSA costs. I think Jim Mogenson’s points are relevant here too. I noticed the newly-minted “AAATA” did not mention anything this board meeting anything regarding the ACLU suit in federal court that was setled which had been carried by the Associated Press. (A)How much money was alluded to by ACLU attorney Daniel Korobkin when he indicated monies were paid to the ACLU toward its fees and expenses? (B)Who paid the defending law firms and expert witness Aaron Ahuvia and how much was paid? (C)Who requested the confidentiality clause in the settlement agreement? FOIA requests are being considered to disclose this information. $109,000 seems like a lot for a hydrant. You can buy a house for less. did anyone else notice that there were cars parked right by the fire hydrant? I believe you must park at least 15ft. from a fire hydrant within the city of Ann Arbor…. oh, forgot to include that I was talking about the picture at the baginning of this article, showing cars parked right by the fire hydrant. Regarding the Comprehensive Transportation Fund, I reviewed the sources and use of the CTF in a post [link] which also considers the connection of the RTA with this funding. As Carolyn Grawi noted, RTA meetings have been held in locations relatively inaccessible to Ann Arbor residents (for example, in SEMCOG’s Detroit headquarters), but it was mentioned at this meeting that the RTA will hold an October 2 meeting at the Ann Arbor District Library (2 p.m.). I assume that will be confirmed later but this will be an excellent opportunity for those of us in this area to observe the RTA board in action. The cars are parked in a parking lot, in spaces striped for parking. There’s an aisle on the near side of the grassy island that runs next to the headquarters building, the location from which the photo was taken.